Happy Friday! 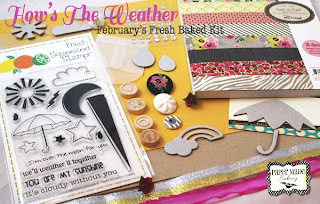 You may have arrived here expecting the March kit reveal and blog hop.... well, we've have had to adjust things a smidge. Never fear... I (Glenda) am here today to share some cards with you and reassure you. The blog hop and kit reveal will happen on Monday March 4th. To make up for the lack of a blog hop today, I've whipped up two cards for you. Managed to use my sewing machine again. I'm happy that I can leave it set up... so I can try to use it more often on my cards. Now, if I could only work on that pile of mending that's been sitting there for a year! One note about this card... the button is actually the same dark pink as in the paper but Photoshop & my camera didn't seem to agree with me. My other card is pretty clean and simple. I used one of my die cut chipboard pieces for the sun and several little bits of the paper from How's the Weather? The fun thing about this card is that it has a few 'hints' about what is going to be in the March kit. Any guesses? ;) Can I just say... you are going to LOVE IT! It's full of a lot of my favourite things. 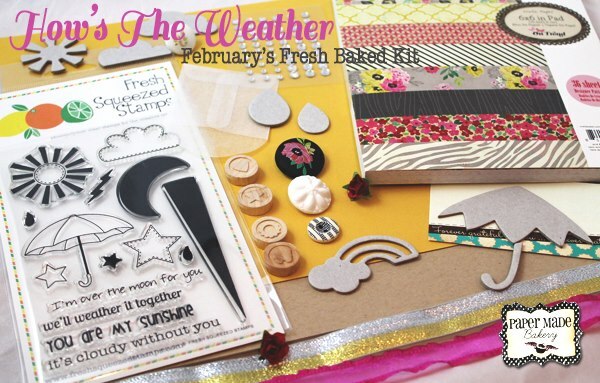 :) I digress... remember, the February kit, How's the Weather?, is still available. Thanks so much for stopping by. Check in later today as Shannon will be posting the Color Cubbie winner. Also, Amy will be here tomorrow with another card to share. Ohhhhhhhhhhh these cards are gorgeous!!! Love love love them!! Cute cards, Glenda! Wonderful uses of patterned paper and embellishments. These colours are so cheery! Adorable cards Glenda! Your stitching is fabulous!